Bright Star are a team of specialist lending experts that deal with mortgages, loans and other financial matters. They are a multi-award winning business and have already originated over £1bn in specialist lending since their inception in 2011. 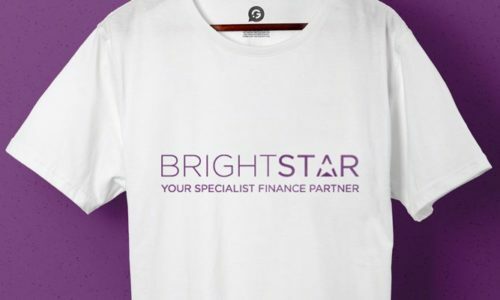 Bright Star contacted Garment Printing as they needed a number of white work shirts printed with their logo for a specific business event their were holding. We used Colour cut-out transfer on the left breast, and one colour cad-cut vinyl on the centre back. We managed to get the T-Shirts printed in no time and got them delivered before the deadline.